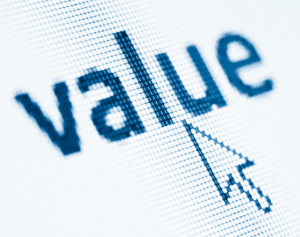 [Infographic] Is Your Content Adding Value For Your Brand? Does Your Added Value Proposition Include Worthwhile Content? Take a look at this cool, and very scary Infographic. This is your online attention competition in real-time. Watch it for 10 seconds and see how many tweets, posts, pins, shares, likes, purchases, videos, check-in’s, searches and so on occur. Does your content stand out as the “thing” to click on? Or are you clogging the information highway? There are plenty of experts out there who will suggest a rate and frequency for tweets and posts and emails and all things digital/social media marketing. They will say you must blog, and you must share, and give you percentages for how much and where. This is all cool, and it’s handy information to have as long as what you are contributing or passing along has some real value for your audience, and if you have a shot for it to be noticed amongst these still moving Infographic stats. What has value? It’s probably easier to answer “why are we here” these days. However, here is how I look at it… If you are still reading this post, it had value. If you take something away from it, it had value. Content marketing might be the new black, for now, but tolerance for capitalizing on keywords and clicks will be short lived by the readers who can see right through it. They want MORE than that. They want stories, they want to know you, they want to understand what you have in common, and what makes you different. Value will always lie where authentic voices rise to the occasion.